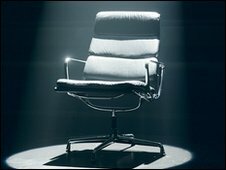 The series producer of Mastermind has denied claims the show is dumbing down. Jon Kelly told the Radio Times the quiz has always included popular culture subjects. Kelly said: "Punk rock was once a subject, as was Doctor Who. People like to think that the olden days were better." Last year Jeremy Paxman was quoted as saying questions on Mastermind had become easier. In 2007 Jennifer Aniston was allowed as as a specialist subject. Kelly added: "The show reflects the interests of modern Britain and they can be popular culture subjects. "I think there's a common misconception that the previous Mastermind didn't have any popular subjects, but it did." Kelly has also revealed topics that have been rejected as specialist subjects. They include Routes to Anywhere in Mainland Britain by Road from Letchworth, the Banana Industry and Orthopaedic Bone Cement in Total Hip Replacement. For potential contestants thinking of entering the quiz he warned not to choose too wide a subject matter. One man was rejected who wanted to answer questions on The History of the World since Jesus Christ. Kelly said: "We rule out things that we have done too recently and the subject has to be sufficiently dense that we can write enough questions." There are plans for a Mastermind Champion of Champions series where older winners will compete against more recent ones.